Situated in Melbourne’s outer east, J&P Flexographics has been proudly supplying high quality flexible packaging solutions for Australian and Global Food, Beverage, Industrial, Health & Wellbeing Markets since 1987. A wholly Australian owned company, we offer a wide range of flexible packaging options in printed, plain, single web, laminated and perforated materials, including pre-made bags and pouches, to meet all of your packaging needs. Our goal is to always provide unsurpassed quality in product, service and delivery whilst continuing to seek out the latest innovations to support our customers’ markets and provide responsible, sustainable opportunities for the future. Supplying high quality flexible packaging to meet our customers’ demands in a timely fashion at a competitive rate. Empowering our people, the flexible packaging experts, to provide exceptional service coupled with accessible and innovative flexible packaging solutions. Delivering your product to meet your Market needs – today and tomorrow. A view to the future for responsible, sustainable manufacturing options. Being here for the long-term. Always going to new heights to be flexible. J&P Flexographics had its start as a small print shop in 1987 in Melbourne’s South East. The business was founded by two business partners, on the principles of delivering fast, professional results for the growing flexible packaging market in Victoria. With careful planning and dedication, the company has successfully grown year on year to its position today, employing 34 people and offering a broad range of flexible packaging materials to the FMCG Food and Beverage, Industrial, Health & Wellbeing Markets Australia-wide. 1987 Commenced trading as J&P Flexographics Pty Ltd, out of a small print shop in the industrial hub of Moorabbin, South East of Melbourne. 1990 J&P relocated for the first time to Bayswater, and operations grew from a team of two to four. 1999 The Business expanded into a neighbouring site, needing more warehouse space as demand grew stronger. 2007 A second relocation to a modern, purpose-built site in Bayswater. This is the home of J&P today. 2017 Celebrated 30 years in operation! In 1987, J&P Flexographics started out with a team of just two. Now we have acquired a team of over 34 dedicated, experienced Flexible Packaging professionals with an outstanding accumulation of years of knowledge in the Industry. Our vision is to engage more keen professionals to develop the business for future growth and support our customer base. An allocated Account Manager responsible for their packaging needs including supporting logistical, technical, innovation and marketing requirements. Exemplary in-house Customer Service for the smooth progression of all orders. Access to superior technical expertise from our Technical and Printing personnel for all value-engineering, material, pre-press, printing, sustainability and quality requisites. Fully qualified Operators manufacturing their product. Logistical personnel ensuring the safe delivery of their product to meet agreed timeframes. Our Senior Management Team taking an active interest in their business and products. Our reputation for quality product and achieving excellence in Speed-to-Market is as a direct result of the personnel who work at J&P Flexographics. Our industry is competitive – we have the people and systems to meet the challenge. We will work with you to ensure you achieve your business objectives by having the right people in place to support you. Understanding our customers’ markets and market trends. Creating action plans to reach agreed goals. Communicating process milestones and outcomes. Forming and maintaining strong supply relationships. Optimising efficiencies through Planning, Procurement, Production and People. Ensuring our customers always have a contact point for questions and quick responses. Working together toward the future through responsible and sustainable innovation. Our Speed-to-Market reputation is widely acclaimed within our customer base. We believe our high standard of customer service is paired with the integrity of supplying quality product. Quality and Food Safety are critical to the success of all flexible packaging products. J&P Flexographics understand this need. We maintain stringent quality controls within our business. We expect the same attention to quality standards from all our suppliers. We aim to maintain high, quantifiable standards of quality and traceability throughout the entire supply chain. We commit to deliver quality product. We are committed to continuous improvement action plans for our quality processes. We welcome customer audits and any questions regarding our HACCP system. 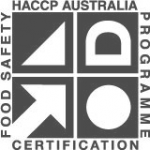 J&P Flexographics has maintained HACCP Accreditation since 2009. J&P Flexographics has a proud record as an environmentally responsible manufacturer of flexible packaging. We continue to strive to source the most environmentally friendly methods of material disposal and recycling. We continue to explore methods and opportunities to minimise our waste output, by adopting Eco-Safe products into our manufacturing methods and working with customers to minimise waste by exploring potential innovations in film technology and machinery use. Re-cycling – in our production processes and office areas. Energy Efficiency – efficient lighting and energy use. Chemical Handling – meeting protocols in accordance with local regulations and using licensed recyclers and/or waste disposal agents. Storm Water – keeping them free of any impact from our manufacturing footprint. Raw Materials – ensuring we are up-to-date with the latest sustainable films suitable for customer use.